It's Valentine's Day on Friday! 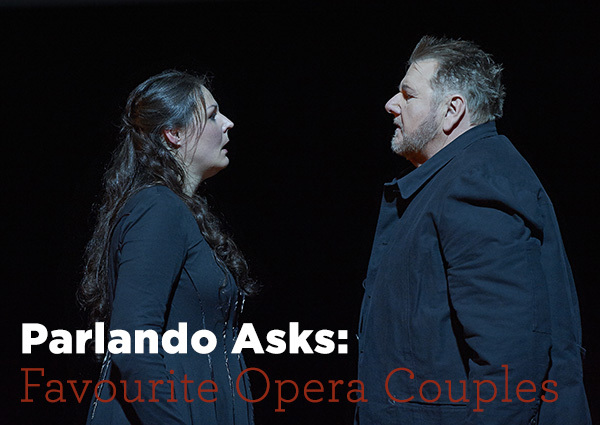 Last year we asked you to name your favourite romantic arias and duets, but this year we want something different. 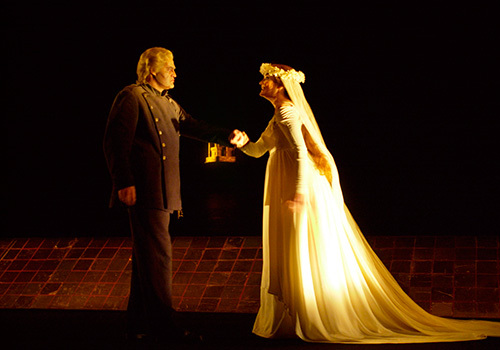 Who is your favourite opera couple? Do they have a great relationship? A toxic one? Are they a power couple or is their love unrequited? Don't forget that you can celebrate Valentine's Day at the Four Seasons Centre with a special P.J. 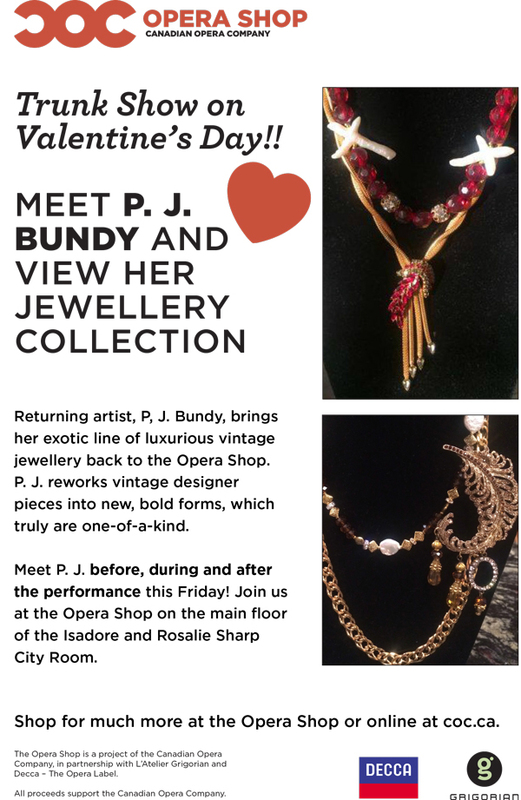 Bundy trunk show in the Opera Shop on Friday, and if you buy full-priced tickets to A Masked Ball on February 14 and 16, you can enjoy a complimentary glass of bubbly and a chocolate treat! Until then, read our answers below! 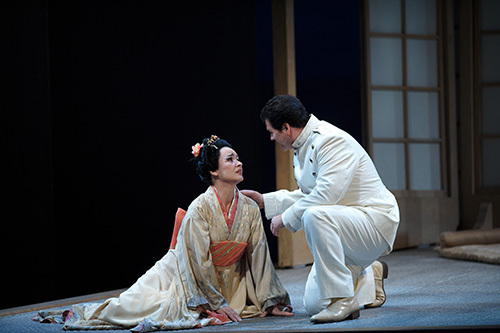 As we continue to prepare for our 2013/2014 season, one of the most common questions we hear from patrons at the Canadian Opera Company is "What is a good opera for a beginner?" We put the question to our staff, some of our artists and our social media followers to see what the results would be! We polled our Facebook fans about the best opera for a beginner and the answer was The Magic Flute, followed by Carmen and La Bohème! Other interesting suggestions included Lakmé and Rusalka! Read on to see what our staff had to say. Parlando Asks: What was your first live opera? Recently we were inspired by an interesting article in The Grid TO about taking children to live performances, and it begged the question, what was your first live opera? Read on for some of our answers, and share your own experiences in the comments! Nikki Tremblay, Assistant Ticket Services Manager - I remember my first operas vividly, it was the night before my interview for this job at the Hummingbird Centre, October 2001; Bluebeard's Castle and Erwartung. These two productions clinched my desire to work here. I loved Bluebeard's Castle and fell in love with Erwartung. Both were so modern and full of tricks and mind games. Andrea Salin, Associate Ticket Services Manager - My first live opera was a student dress rehearsal of Boris Godunov at the Hummingbird Centre in 2002. Cameron McPhail, Ensemble Studio Member - I'm slightly ashamed to confess that my first live opera was Don Giovanni, but I was singing the role in Prague; so I guess I had great seats! I hadn't been to an opera before which was probably why I agreed to do it in the first place. In hindsight, I might have sung something different as my first role, or at least gone to see a few first – the downside of business school!